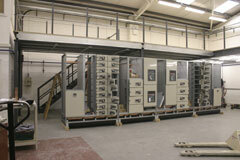 Davenham Switchgear Ltd is a wholly owned Irish company founded in 1982. 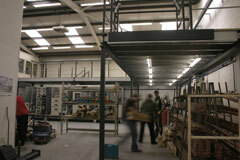 The company is based in Clondalkin, Dublin and has a modern 2,000 square metre manufacturing facility. The company is a market leader in the design, engineering, manufacture and commissioning of electrical distribution and control solutions for major industries. The company’s facility has the capacity to produce over €1 million per month with a workforce of 75 people. Customers include Intel, Wyeth Pharmaceutical, Cadburys, Office of Public Works, Schering Plough Pharmaceuticals, Aer Rianta, Analog Devices and Boston Scientific. 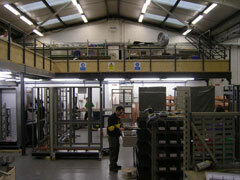 Euromech was commissioned to design, manufacture and install a 79 square metre Mezzanine Floor within the existing manufacturing area. 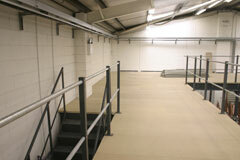 The mezzanine was specifically design to accommodate Davenham’s various substation, switchgear and switchboard systems that are partially assembled both on and below the mezzanine floor. 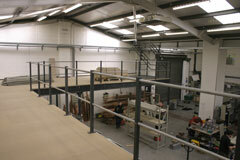 This necessitated a clear height of 2.7m from the main beams of the mezzanine to the workshop floor to accommodate the large heights of Davenham’s products. Due to their weight and size, products have to be moved on pallets during assembly, for which Euromech designed and installed a specific Pallet Safety Gate for the mezzanine floor to enable quick transit of product from manufacturing to shipping.